Ms. Lenni was born on Sumbawa Island, Indonesia. Growing up, her passions were always caring for young children and geography. Her parents moved from one island to another in Indonesia, creating curiosity in her about the similarities and differences between one place and the next in spatial context. Especially the connection between environment and cultural phenomena. When she was a little girl, her dream was to be a kindergarten geography teacher. 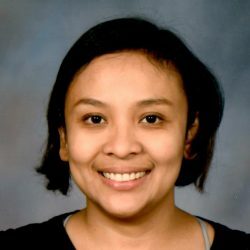 She earned her Bachelor of Science from the Faculty of Mathematics and Natural Sciences at the University of Indonesia with Geography as a major. Following her graduation in 2003, she worked for a mapping company in Jakarta, Indonesia for 7 years. She came to the United States in January 2011 to join her husband. She now lives in Monona, WI with my husband and our son Ali. Ali is 6 years old and he is attending the Lower Elementary program at Blooming Grove Montessori. Her Interest in Montessori education started shortly after graduating from university. The approach to peace education interested her the most. She joined Blooming Grove Montessori in 2016. She earned her Montessori Paraprofessional Certificate from Seton Montessori Instituted, Infant-Toddler Capstone Certificate from the University of Wisconsin-Platteville and recently completed the RIE Foundations: Theory and Observation training. During her free time she loves sewing and cuddling with family.